In the minds of a modern man, a brand is commonly associated with some fashionable perfume or at least a bag and definitely not with the profession of an artist. To the majority of those not engaged in any artistic practices, an artist seems to be a person who is able to deliver the image of a beautiful world around us in a visually echoing manner. Fascinated with contemporary art, people scan any artist for a story of a rebellious soldier who is capable of loud manifestations. Nevertheless, a successful artist today is a successful brand in the first place. The postmodern era of the second half of the 20th century was marked with the traditional society’s complete paradigm shift. Since that global change, the world has no longer been considered as a beautiful place filled with divine wisdom of its creation, as in the modern era. And even if it happens to be so, nobody cares anymore. Because in the core of everything in the postmodern era is a man and his unique personality. Having the communism, nihilism and other isms of the 19th — 20th centuries in the background, we turned back to Christianity and its image of an individual just to reconsider it and find out that we hate its former interpretations even more. Now a postmodern era artist has to prove his uniqueness to the world by performing some unparalleled artistic act. I recall the story of the Italian artist Piero Manzoni, who was the first one in the art scene having the guts to exhibit his faeces as an art object. By this and some other exclusive performances, he transferred himself from being an ordinary person to becoming a contemporary artist. 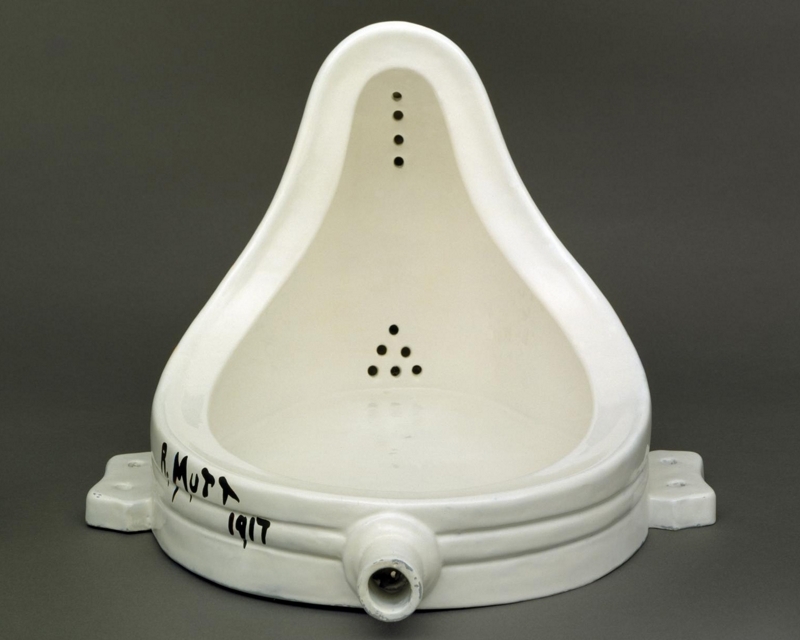 It all started with Marcel Duchamp. Not only he left a bold question mark hanging over the entire era of art before him formulating the idea of ready-made objects. He also indicated or maybe just caught the point when everything including art started to transform into a Brand. A brand is a pattern that helps a modern individual save time and energy*. If one wants to enjoy listening to music, he goes to the nearest audio equipment store and comes out of it 15 minutes later with ‘Beats’ brand headphones. Not spending a mere second to decipher the number of decibels or measure their sound quality. A brand is a highly demanded mechanism in our era. It saves our brain the time and effort of processing new data. Among other things, brands help our brain to survive the endless caravan of innovations and data that attack it from all sides. But in order to start operating, a brand first needs to overcome the brain’s information noise protection system. One of the most efficient ways to do so is to affect us emotionally. Positive emotions stimulate hormone release, and hormones are what makes our brain completely happy … and completely defenseless! Therefore, a brand’s weapon of choice in the battle for our brain is an emotion. Everyone (including me!) drinks Coca-Cola not because we are that devoted to drinking black peculiar flavored liquids. Since childhood, we have been conditioned to associate this brand with Christmas and holidays and parties with friends (or the illusion of those). The Coca-cola brand linked the neurons in our brain in an indivisible logical chain: beverage — holiday — fun — Coca-Cola. The creation of a powerful brand identity is the job for marketers and designers who are responsible for a company’s visual communication with our brains. Their mission is to create and associate an emotion with the brand name and to produce an easy-to-read visual image according to that. Then the image must be copied countless times in order to get the job done. When our human brain gets used to it, it starts to consider it safe and native. Almost 15 years of design experience background makes me sure that the better the marketing and advertising departments work, the more powerful the brand is and the better the product sales are. Well, we know what are a brand, its influences, and purposes more or less clear now. But what does art have to do with all of that? The fact is — the newest art of the postmodern era is also a brand exploited by an artist. The artist saturates his work with a distinctive visual style, incorporates a message, an emotion, and multiple repetitions in it, thereby ensuring recognition of his name and higher demand for his goods. The only difference is that these emotions and messages, unlike fast moving consumer goods, can be negative. Let’s try to see how the branding logical chain works in the case of modern art. Multicolored circles — homeopathic pills — health. 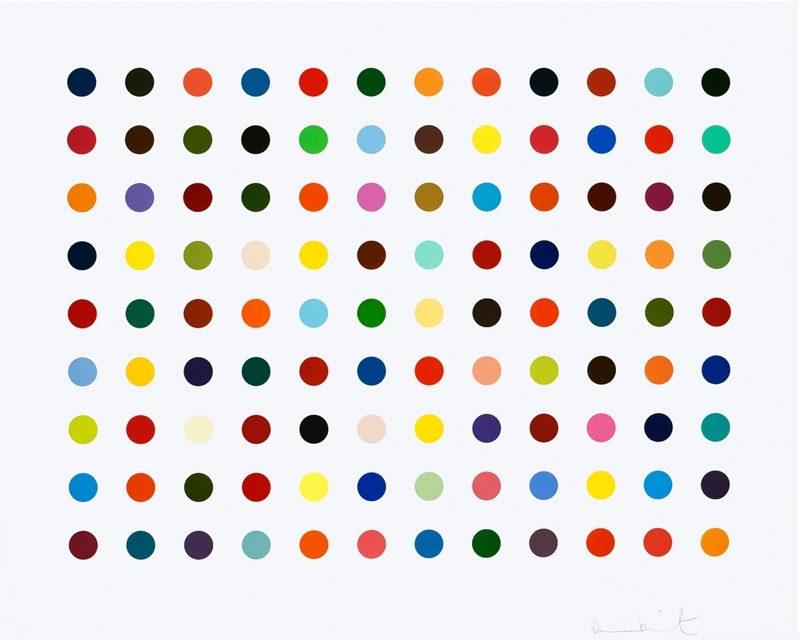 Damien Hirst. 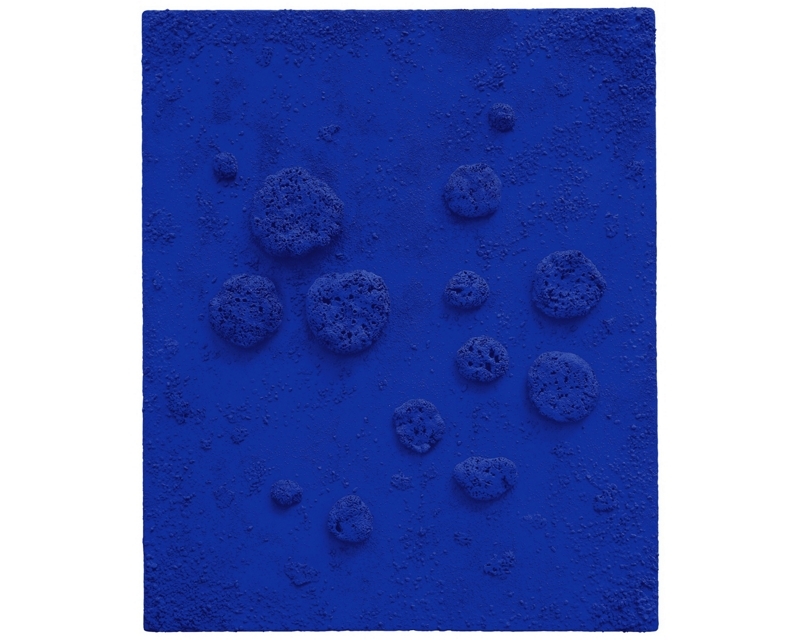 Ultramarine — bright paint — courage — Yves Klein. 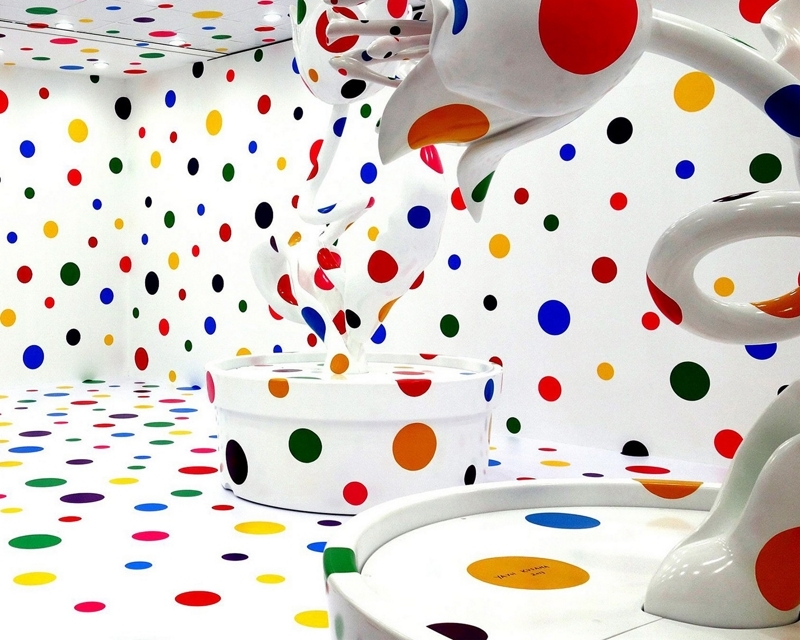 Circles — madness — fear — Yayoi Kusama. We see the same chain of the brain conditioning of a highly recognizable visual image that forms a message, triggers emotion and leads to the name of the artist as a result. The formula for establishing the right brand-customer relationship on the subconscious level remains the same. An artist of the 20th — 21st centuries exploits the brand the same way a marketer or a designer does. The artists of past eras for sure used some branding techniques, but never have they ever done it with the fierce confidence of contemporary artists. A powerful brand is an all-time business plan that will help you sell your work not only to the richest people in the history of mankind but perhaps in the history of art itself. Does this interfere with the artist’s sincerity? Not necessarily, I think. Like the masters of the previous generations, a contemporary artist does have something to narrate to the world. But due to the conditions of modern life, which is now overloaded with data and the unprecedented competitions, it becomes more and more challenging to convince anyone to hear you out. To become successful, an artist must convert himself into a brand. So he does.